Why can’t we have owners like the Haas family, who respect the tradition of the Oakland A’s and are willing to spend money? Why not indeed? These damned money grubbing owners, all they want to do is (insert conspiracy theory here – apparently the theorists can’t even come to a consensus this), they don’t care about baseball! We need to exhume Wally Haas, reanimate him, sue MLB and the A’s to invalidate the last two ownership groups, and put the soon-to-be canonized man back where he belongs, as owner of the A’s. Nostalgia’s great, isn’t it? We can choose to ignore certain facts that we feel are inconvenient. We can bask in the glory of the great triumphs while whistling in the dark about the more unsavory aspects. When Rickey Henderson came back to the A’s during the ’89 season, it was a signal to fans from Haas and Sandy Alderson that the team was serious, that it was going to make its run. We all know about the great payoff for that season, but what happened the following years? As you can see from the chart below (data from the old Business of Baseball website), it was a tremendous struggle to stay competitive in the wake of baseball’s economic upheaval. Some call it charity on Haas’s part, I see it more as a very shrewd strategy. Haas saw that the Giants were struggling to get a new stadium in San Francisco, and there was a distinct opportunity for the A’s to have the Bay Area all to themselves if the Giants left for Tampa Bay, or most of the Bay Area if they moved to San Jose. The light blue line is the leading indicator. 1990, the team’s last World Series appearance, was the last profitable season during the Haas era. From then on, the team lost a combined $30 million in 5 seasons. That’s the equivalent of an entire season’s payroll back then. Currently, the average payroll is around $90 million. Can you imagine the A’s losing $90 million during a 5-year span? 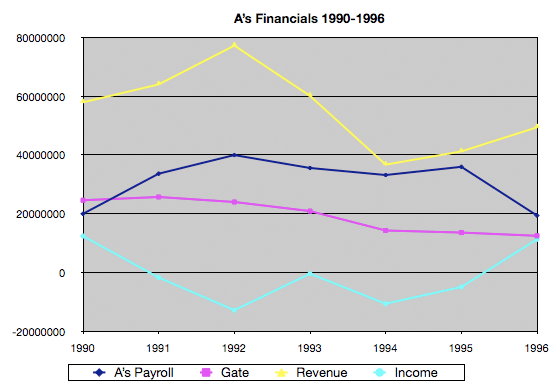 Fortunately, revenue sharing is around to help the bottom line, though even with the annual revenue sharing receipt, the A’s would still lose money since their receipt would drop proportionally as their revenues rose. It’s good to remember the on field successes and the work done to get them. Throughout my childhood, I listened to Bill and Lon on my parents’ 70’s-era Sears console stereo in the living room while I did my homework. I still remember KSFO often using Madonna’s “Borderline” as bumper music between innings. As great as these memories are, the successes did not occur in a vacuum. Incredible amounts of money were spent, from the core of the team to the annual rent-a-slugger and solid veteran 4th starter to having both legends King and Simmons in the booth. It’s not only impractical to expect that of Lew Wolff, it’s patently unfair. Every owner does what he can with the cards he’s dealt. Wolff signed off on a $79 million payroll in 2007, only to have the team beset with injuries. Hope springs eternal this season, but already we’re seeing the injury bug decimate the pitching staff. (Side note: let’s not get too excited about Anderson or Cahill yet. For every Big Three, there’s also a Generation K – knock on wood.) If the team manages to stay competitive during the first half, it’s likely that we’ll see a big arm rental along with Matt Holliday stay through the end of the season. If not, guys will be sold off and we’ll go back solely to grooming young guys who can hopefully stay healthy. We know that Billy’s going to try to get value whenever and wherever he can. The cycle will repeat itself continually until a new stadium is built. It’s sobering, but those are the Wolff/Fisher group’s – and our – cards.